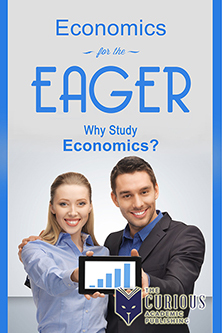 Professor Michael Ben-Gad has written a chapter in Economics for the Eager: Why Study Economics? A City economist has contributed to a new book that aims to inform students about the benefits of pursuing economics as a career or university subject. Professor Michael Ben-Gad, of the Department of Economics, has written a chapter for Economics for the Eager: Why Study Economics? The book, published by The Curious Academic Publishing, is recommended for high school, college and university students considering an undergraduate, Masters or PhD degree. Professor Ben-Gad has written a chapter called Economists put the `Science' in Social Science, which explains what economics is, why economic models are useful, what characterises the approach of economics, what a good undergraduate course should teach students and what programmes are on offer at City. He said: “A conventional view is that economics is the (a) study of markets, where people buy and sell things, usually in exchange for currency; (b) of banks and financial institutions; and (c) of how countries differ in material wealth and national income. "All of this is certainly valid, indeed, it characterises the majority of the undergraduate and postgraduate curricula at City University London and other good universities. There is, however, a more expansive, indeed some would say imperialist, perspective, which holds that the analysis of nearly any social interaction can benefit from applying the tools developed by economists. The book includes entries from more than 30 top professors, including Nobel Prize winners Professor Peter Diamond (Massachusetts Institute of Technology), Professor Oliver Williamson (University of California, Berkeley), Professor Michael Spence (New York University), and Professor Thomas C Schelling (University of Maryland). The contributors aim to offer answers to key questions in plain English, including: Why should a student choose economics as their undergraduate degree? Why undertake a post-graduate/research degree in economics? What are potential research areas and scholarship opportunities in economics? What are the jobs/career options and best practice tips for the economics graduates?